We’re not creating weather patterns we’ve never experienced before, but they're exacerbated by a warming climate. The drought that’s turned most of the United States into a dessicated hotbox may be a symptom of climate change, a brutal blowback from carbon pollution. Climate scientists, who prefer to speak in terms of probabilities and trends rather than single events, are reluctant to point fingers at any one cause — but signs point to human influence making a natural dry spell unnaturally severe. Funk’s specialty is the dynamics of sea surface temperatures in the Indian Ocean and western Pacific Ocean. Over the last century, and in particular the last two decades, these rose by an average of 1.25 degrees Fahrenheit. Ocean temperature trends can be tricky to interpret, but there’s little scientific disagreement about Indian Ocean warming: It’s almost certainly man-made, a result of greenhouse gases trapping heat in Earth’s atmosphere. The consequences are significant. Heated air holds extra water, supercharging monsoon systems and producing events like 2010′s Pakistan floods. Water vapor is also a greenhouse gas itself, trapping heat and creating a feedback loop of local warming. When the western Pacific is especially warm and the central Pacific is especially cool — the latter a natural, cyclically occurring condition known as La Niña, which has prevailed since 2010 — the temperature gradient causes changes in atmospheric circulation. La Niña generally produces dry spells in southern North America, but adding a warm-to-cool Pacific gradient generates what some scientists call “the perfect ocean for drought,” spreading it far and wide. This occurred between 1998 and 2002, when a similar warm-to-cool Pacific gradient existed and drought struck the United States and mid-latitude regions worldwide. 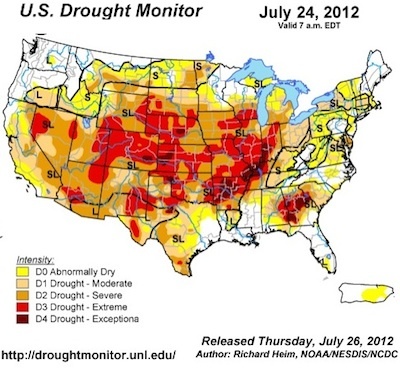 Another, lesser gradient occurred in 2007 and 2008, just before another U.S. drought. The latest warm-to-cool gradient occurred in 2010 and 2011. Martin Hoerling, a research meteorologist at NOAA’s Earth System Research Laboratory who coined the “perfect ocean for drought” term, said it may well help explain the current disaster. Those factors may prove unrelated to human activity, but represent the type of patterns with which climate change interacts, ultimately producing a world that — regardless of this drought’s origin — is expected to become a much hotter, drier place. “We’re not creating weather patterns we’ve never experienced before,” Hoerling says. “But when these patterns do materialize from time to time, through the vagaries of weather, they’re materializing in a warming climate." This story first appeared on Wired and is reproduced here as part of the Climate Desk collaboration.